Telanthera Osiris, Alternanthera reineckii "Pink" (roseafolia) and Alternanthera reineckii "Purple" (lilacina), Alternanthera reineckii "Copper", Alternanthera "Scarlet Hygro". Most Alternanthera species are difficult to grow, but this one is relatively undemanding. A source of iron will help to intensify red colour. the plant is easy to care for if given right condition, which include strong lighting and iron rich substrates. Easy to propagate by nipping off the terminal bud and planting it in the bottom. This also makes the mother plant more bushy, because more side shoots are formed. 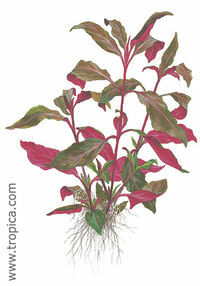 The purple colour underneath Alternanthera reineckii "Pink" leaves provides an effective contrast to the many green plants in an aquarium - particularly when planted in groups. Good light encourages the leaves to turn red.